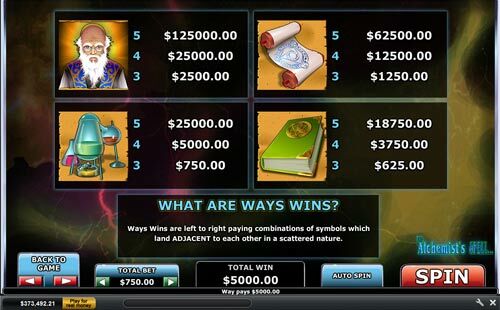 This is a new game from online casino software developer Playtech. It breaks from the Playtech norm of having fixed paylines and offers a 243 ways to win set up. There are 5 reels with three symbols on each reel. You get a win for having 2 or more matching symbols (from left to right) on adjacent reels in any position. This makes for more regular payouts and offers a good return on your stake. The game itself is very simple and does not offer to much strategy to think about. This makes it great to play at any time. The Alchemist is a wild old man mixing his potions and trying to creat big money wins for you. 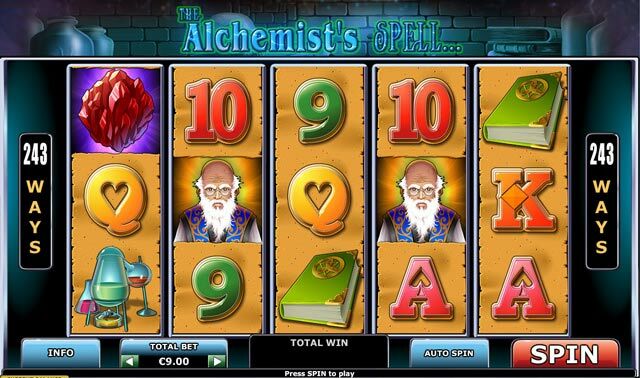 The slot game offer symbols of 10, J, Q, K and A along with the Alchemist himself, his book of potions and his mixing equipment. There is also the wild symbols to boost your wins. The game has bronze, silver and gold wild symbols, these will appear on reels 2, 3 and 4 only. Any wins using a wild symbol will also offer a multiplier. The multiplier is increased depending on how many wilds and the status of it. There is also a FREE SPINS bonus available. The free spins are retriggerable and offer 10, 15 or 20 free games depending on whether you spin 3, 4 or 5 scatter symbols.